Two Tamil National Alliance parliamentarians narrowly escaped a claymore mine blast in an LTTE-held area close to Kilinochchi, one of the MPs said yesterday. An LTTE cadre was killed in the blast on Thursday and two others were injured as their vehicle — a white jeep similar to the one in which parliamentarians Selvam Adaikalanathan (Wanni district) and K. Sivanesan (Jaffna district) were travelling — was caught in the explosion on the A9 highway in the Old Murukandy area, 12 kilometres south of Kilinochchi. “We believe that we were the target as our vehicle was similar to the ill-fated jeep. We escaped because we started our journey late,” Mr. Adaikalanathan told The Sunday Times after he reached his Mannar residence yesterday. “When we arrived at the scene of the blast we saw the burning jeep and the body of the LTTE cadre on the side of the road while the injured were being removed to hospital,” he said. 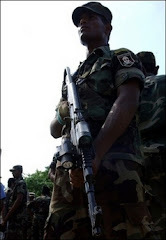 Soon after the blast, members of LTTE’s ‘border force’ and ‘police’ conducted a search operation but failed to detect any of the persons responsible for the attack, he said. An LTTE spokesman yesterday, however, down played the incident, claiming that it was a road accident in which one of its cadres was killed. The incident, near the famous Ganesh temple in Murukandy where travellers usually stop to pay homage, occurred a week after a director of the Tamil Rehabilitation Organisation (TRO) and his driver were killed in a similar claymore mine attack in Periyamadu. Earlier an Education officer was also killed in a similar attack. The LTTE has blamed the army’s deep penetration unit for the attacks.